This past week marked the opening of my CSA (Community Supported Agriculture). I was so excited to go and pick up the first produce of the season. 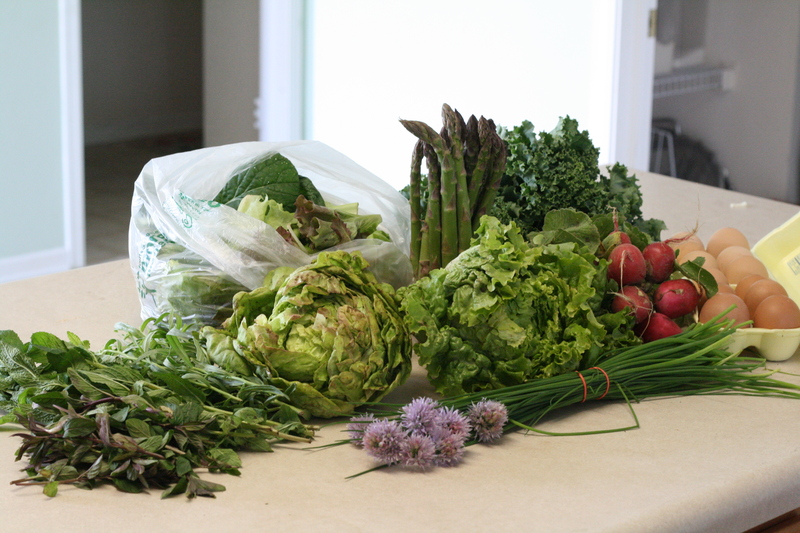 Here's what we received: one bag of mixed greens, one bunch of asparagus, kale, two heads of lettuce, radishes, eggs, chives, tarragon, spearmint and peppermint. 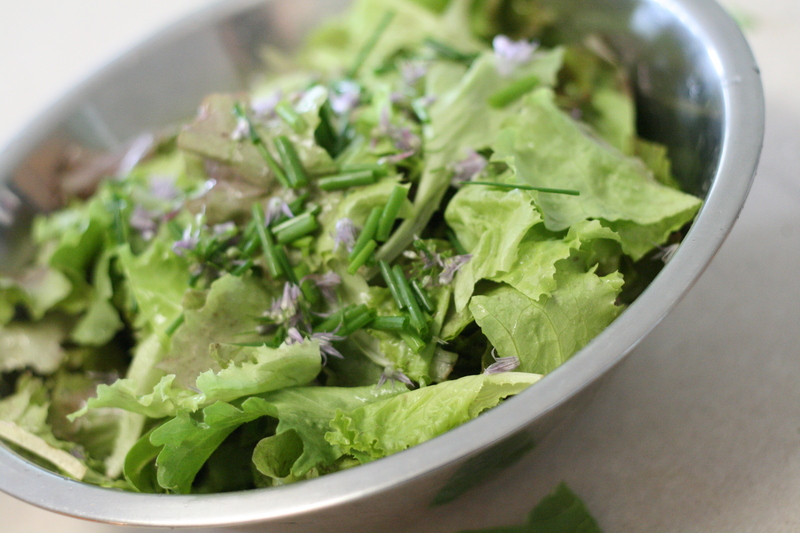 mixed greens and lettuce -- salad; the first salad I made needed to be quick and consisted of the greens plus snipped chives, including the chive blossoms. Salad dressing also needed to be quick and so I used cream, red wine vinegar, salt and pepper. A perfect combination! chives -- the chives have appeared in salads and our egg supper, and I'm thinking of trying to dry some to use in the winter. I'll have to let you know how that goes. kale -- I browned a bit of garlic in some olive oil and then threw in the washed and chopped kale to cook until it was tender. Balsamic vinegar finished it off as a delicious side dish to our pasta dinner. eggs -- we often have eggs on Saturday night since I plan for a large meal on Sunday. Most frequently I mix five eggs with 3/4 cup milk and 3/4 cup grated cheese, salt and pepper and bake it in a greased pie plate. This week I added snipped chives. spearmint and peppermint -- my favorite way to enjoy these herbs is in my tea. I drink Trader Joe's Irish Breakfast Decaf and add a sprig of mint to my mug when brewing the tea (or make a large pot with several teabags and a few sprigs of mint). I drink this hot with milk, but it's also excellent chilled. Some of the mint found its way into the cucumber and sugar snap pea salad that I made again this week. We enjoyed a delicious meal for Mother's Day, cooked for us by my sister. 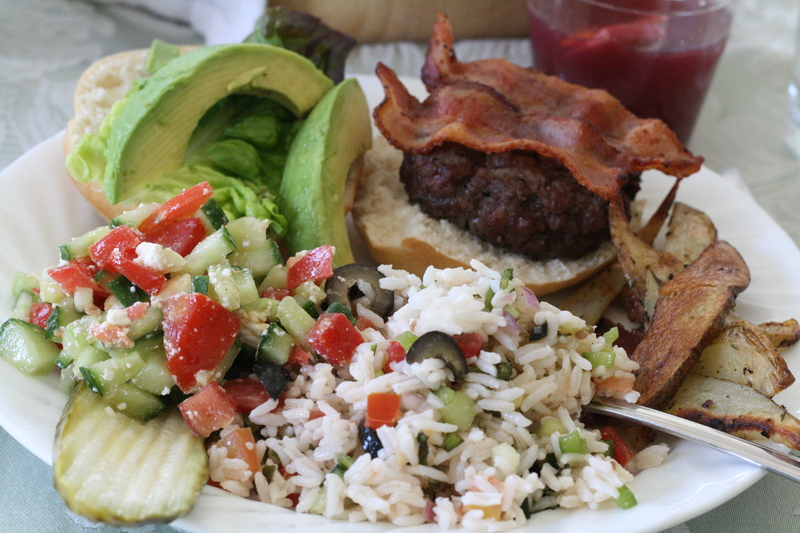 She made hamburgers on the grill with various toppings such as lettuce, tomato, onion, blue cheese, avocado, and bacon. Side dishes included oven fries, rice salad, and Israeli salad. 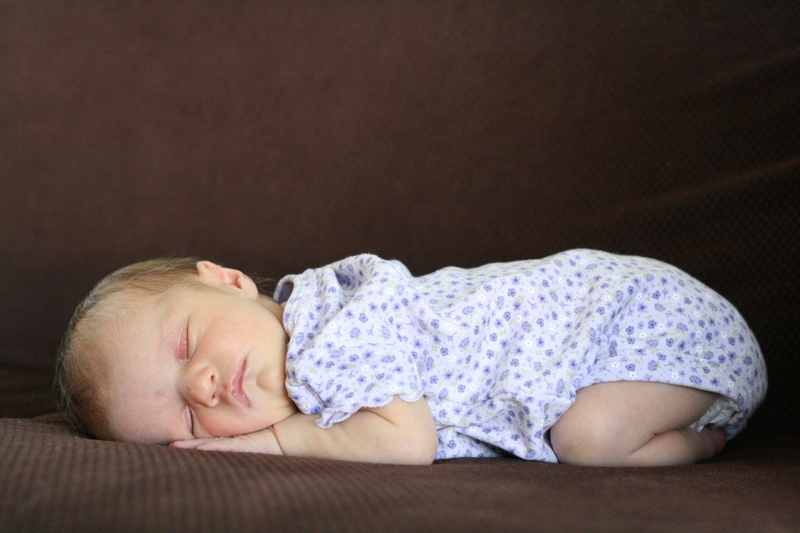 Of course the most exciting thing happening in our kitchen right now is the presence of our baby girl -- Laura Elizabeth -- who arrived on April 27th. And, since Laura's arrival, our family has been enjoying the cooking of many friends who have kindly provided meals for us. We've all enjoyed the variety and I think the kids are sorry to see the meals coming to an end. A beautiful little girl. May she grow strong and healthy. Wonderful assortment in your CSA box. And so many wonderful things you did with the goodies. What a joyful post. I love the way you went through your box and told us what you'd do with it but the picture of your daughter is divine. Lovely post. Now I want to sign up for a CSA! The mother's day meal looks delicious. Gorgeous pic of your daughter. The picture of the produce from your CSA makes me to want to join one! Beautiful spring colors! And since you mentioned looking for a lemon-tarragon sauce for chicken: Here is a recipe for Lemon-Tarragon Chicken I tried last night with good results. Very simple, but flavorful (and healthy!) The recipe comes from the "Cooking Light -5 Ingredient-15 Minute Cookbook:"
(1) Place each chicken breast half between 2 sheets of heavy-duty plastic wrap; pound to 1/4" thickness using a meat mallet. Sprinkle 1/4 teaspoon salt over chicken. (2) Combine olive oil and the remaining ingredients in a small bowl, stirring well with a whisk. (3) Heat a large nonstick skillet over medium-high heat. Add 2 teaspoons oil mixture to pan, spreading evenly over bottom of pan with a wide spatula. Add chicken to pan; cook 2 minutes or until lightly browned. Drizzle 2 teaspoons oil mixture over chicken. Turn chicken over; cook w minutes. Drizzle remaining oil mixture over chicken; reduce heat to low. Cover an cook 2 minutes or until chicken is done. Serve remaining sauce drippings over chicken. I served this over rice with a spinach/raspberry salad on the side. Thanks for the inspiration to add a new spring menu to my files!